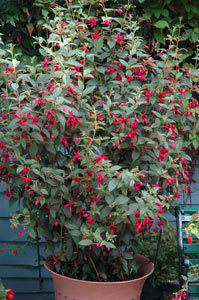 The plant, with two-toned flowers on red stems, is the world’s only climbing fuchsia, suitable for pergolas, trellises, arches, walls, fences and will give years of colour. It will climb up to ten feet and spread over three feet in sun or semi shade, flowering from June to September. The Thompson & Morgan website gives brilliant instructions on how to grow and aftercare information. Current prices while stocks last are 3 jumbo plugs for £7.99, 5 jumbo plugs £9.99, and 15 jumbo plugs at half price £14.99. At prices like these you could afford to buy several and give some away as gifts. Delivery will be by end May 2011, so get your order in now and look forward to a plant that’s sure to attract lots of interest! TERMS: To receive these great prices, please add Fuchsia ‘Lady Boothby’ to your shopping basket and enter offer activation code AFLADYB to activate special offer prices.